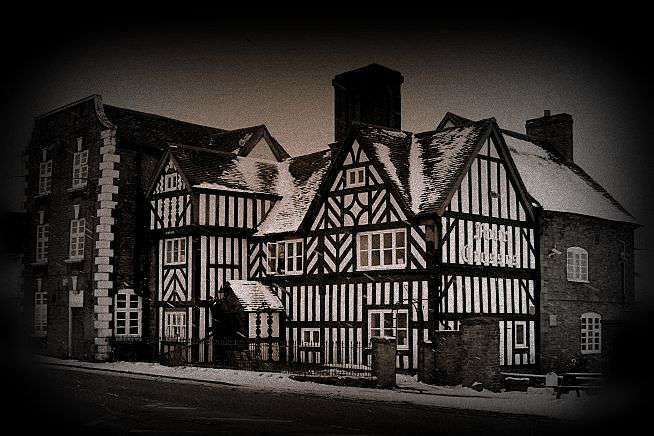 Join the Dusk Till Dawn Events Team at for a ghost hunt at the Four Crosses Cannock, once a former coaching Inn at Cannock Chase. Said to be one of the most haunted buildings in the UK - the Four Crosses was visited by TV presenter Michaela Strachan who filmed a documentary about the hauntings of this property for the Great British Ghosts programme. This very atmospheric building dates back to the 16th Century and is said to be haunted by many ghostly inhabitants. Inside original ancient shipping timbers showing the old age of the property can still be seen in the attic area along with creepy stairwells, bedrooms and a dark and eerie Cellar! The Four Crosses ideal location made it an important stopping off point on the journey from London to Ireland. People who travelled from London tended to sleep at Birmingham, enjoy a meal at the Four Crosses and then sleep again at Newport, before going on to Chester the following day. The Four Crosses played an important role as a provider of overnight accommodation and horses for travellers on the road from London to Chester and Ireland this role came to an end with the coming of the railways. There have been many tragic deaths which have taken place around the Four Crosses over the passage of time this may well be one of the many factors behind the vast plethora of ghost activity said to happen here. Latches lifting on interior doors have been heard along with doors creaking open in the middle of the night. Piano music along with footsteps and cold breezes in certain areas of the building are said to have been heard and felt. There are reports of some Poltergeist type activity with objects being moved and found in different areas within the property also. A female child dressed in rags with pitch black eyes - she is said to have been seen near the fireplace on the main floor of the building. There have been reported sightings of a Roundhead soldier roaming the ancient rooms, as well as a broken-hearted young girl called Emily whose cries have been heard by many visitors. Before booking this event please read the following as per our terms and conditions that are agreed at the point of sale: All payments including deposits and payments in full are non-refundable and non-transferable regardless of any circumstances. When you make a booking with us it is entirely your responsibility to ensure that you are able to make the event date that you have booked, as Dusk Till Dawn Events cannot offer a refund or transfer your places onto another event date if you or any of your party are unable to attend. The reason for this is that all places are paid for in advance to our locations, which means we are still liable for these costs even if you cannot attend the event. Regrettably this event is not suitable for people with mobility issues.